There’s a limit on the total value of pension benefits you can build up throughout your lifetime without getting a tax charge. 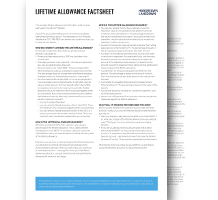 This limit is known as the lifetime allowance. It is now £1,055,000. This information is not personal advice. You should not take, or refrain from taking, any action based on this information. You should check you're making the right decision for your circumstances and that you understand all your options and their risks. The government's free and impartial Pension Wise service can help you and we can offer you advice if you’d like it.